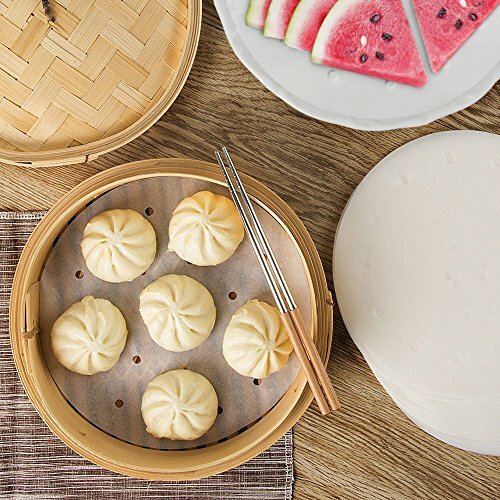 Taking the reluctance out of steaming sticky Chinese Pork Buns, fish, rice paper wraps and so many kinds of exotic foods, these 9-inch diameter steamer liners will be a handy addition to your pantry supplies. 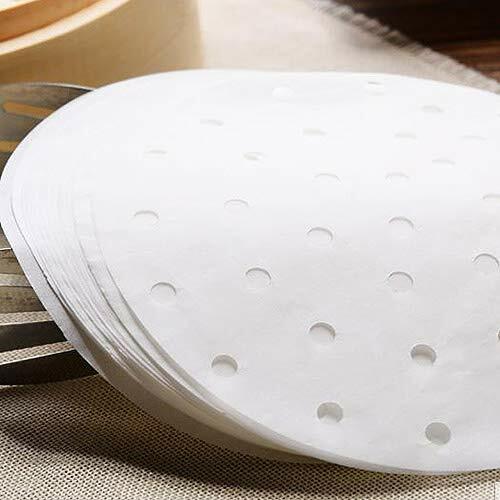 Perforated parchment liners with a lot of holes which spread evenly, these air fryer liners allow steam and hot air circulate inside steamer & air fryers, speeding up steaming process while retaining the original taste of food. 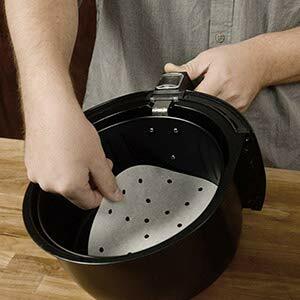 Place a liner into your steamer, set the food on top then steam as you normally would. Steam will still circulate around the food naturally and when it's time to remove or serve, your offerings will release without sticking or tearing. 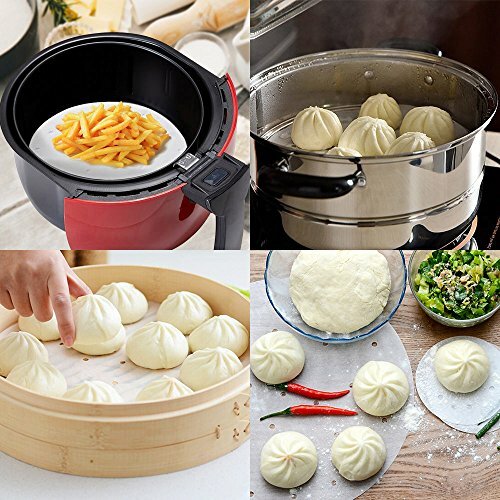 Whether you are using bamboo steamer or air fryers, and whether you're in the mood for dim sum, couscous, broccoli, or salmon, you can count on our steamer liners to get healthy cooking and enjoy authentic flavor. 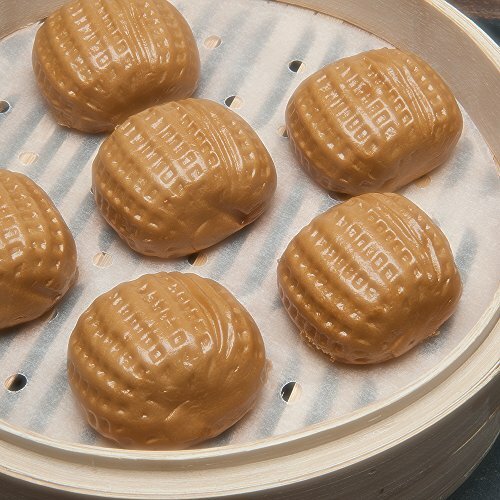 Steaming is a healthy, low-fat, fast cooking method that ensures great flavor with minimal nutrition loss. 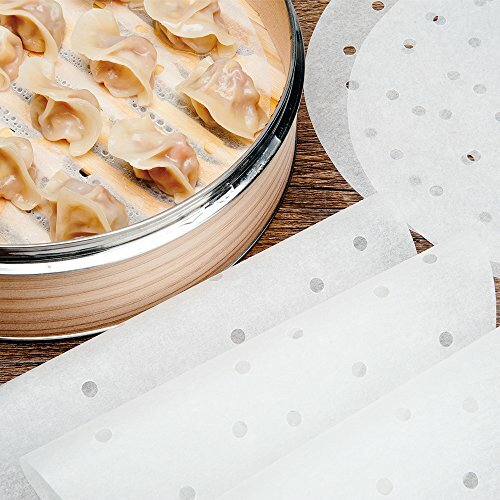 A set of quality steamer lining will not only make your steaming easier, but will also inspire you to make better steam food for you and family members. We want to ensure you have high quality product and buying experience, so if you are not 100% satisfied please don't hesitate to contact us. We will offer FREE REPLACEMENT or REFUND without any costs from your side. 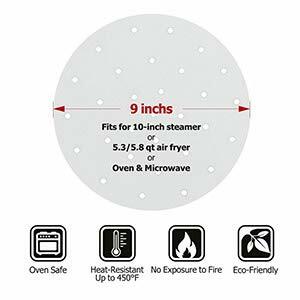 Adequate in Sizing, Fit Most Steamers/Air Fryers - These bamboo steamer liners is 9 inch in diameter, which fits 10 inch bamboo steamer and 5.3 Quart (or smaller) Air Fryers. A Gift for Healthier Life - Steaming is a healthy, low-fat, fast cooking method that ensures great flavor with minimal nutrition loss. 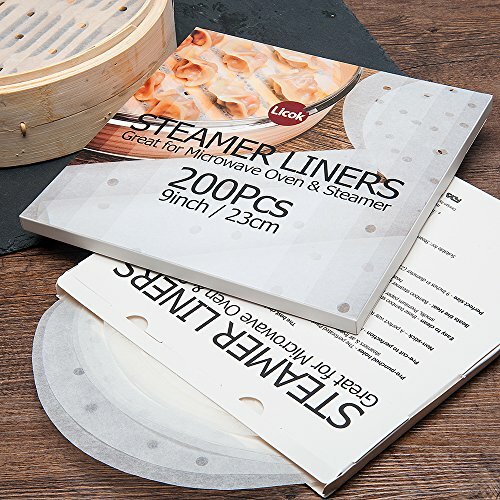 A set of quality steamer lining will not only make steaming food easier, but will also inspire you to make better steam food for you and family members. 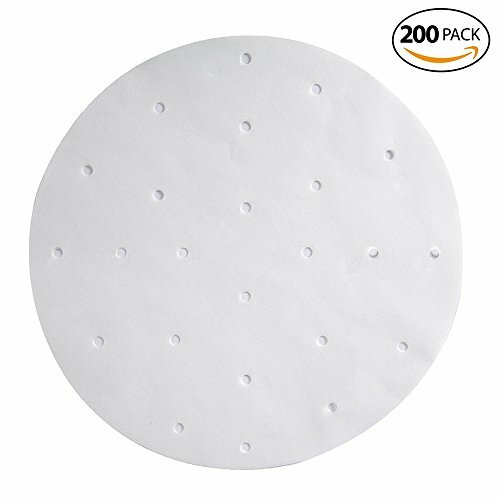 Your Purchase is FULLY guaranteed - Manufactured under strict quality standards, our steaming papers are non-toxic, eco-friendly and sturdy. We also offer WORLD-CLASS customer service with FREE REPLACEMENT POLICY, without any costs from your side. If you have any questions about this product by Licok, contact us by completing and submitting the form below. If you are looking for a specif part number, please include it with your message.